As a tour guide I often had to translate for foreign guests in Irish Whiskey distilleries and sometimes the stories didn’t add up. Like – do you really roast barley to get Whiskey? Hang on – they do that to get red ale or stout, right? Because I’m a guide, I didn’t ask the question while the group was around – you are not supposed to steal the show. “Pot still whiskey is called pot still because it’s distilled in Pot stills” Seriously? I thought it’s a mix of malted barley, un-malted barley and maybe other corn? I was confused but didn’t know enough to answer questions from my clients and had to tell them that I’m not a whiskey expert but will find out. 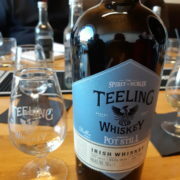 My first tasting was with Shane Fitzharris, brand ambassador for Walsh Whiskey at the time – it was in Tullys Bar Carlow and wow, it was an eye opener. That was also my first encounter with The Irish Whiskey Society who hosted the event. 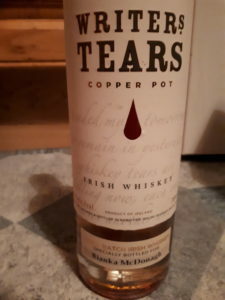 We tasted Writers Tears, Founders Reserve, and 12-year old Single Malt… and in the raffle, I won a bottle of Writers Tears – then called Pot Still, now it’s the Copper Pot. My very first bottle of my collection. I got hooked, and I wanted to know more. A Course came along by Mitchell & Sons “Irish Whiskey Appreciation Course” where we got all the details and could ask as many questions as possible without looking daft. It was a very comprehensive course covering blends, malts, independent bottlers and pot still whiskey. 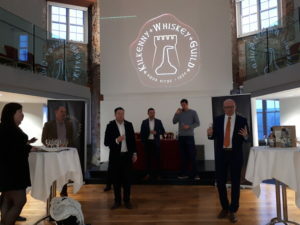 We had great ambassadors like Seamus Lowry from Bushmills, Ger Garland from Irish Distillers (The Jameson Distillery in Midleton), and others. It was a great course but I still had a problem. During the tasting I heard: “you should get floral notes – or – maybe a hint of spice” No, sorry, I only get a burning taste in my mouth. When I asked how to develop my palate I was told “drink more whiskey” What a hard task! My journey began. Whenever I was somewhere, I tasted Irish Whiskey and took notes. I still do that most of the time today and compare them with the notes I did earlier. It’s very interesting and also proves that palates change with times. My big idols are Ivor from WhiskeyTalk2You, Omar Fitzell from ThatsDramGood, Dave from Daves Irish Whiskey or Stuart Mcnamara from IrishWhiskey.com. There are many more, but those are the ones I follow regularly on twitter, their blog or on facebook and instagram. 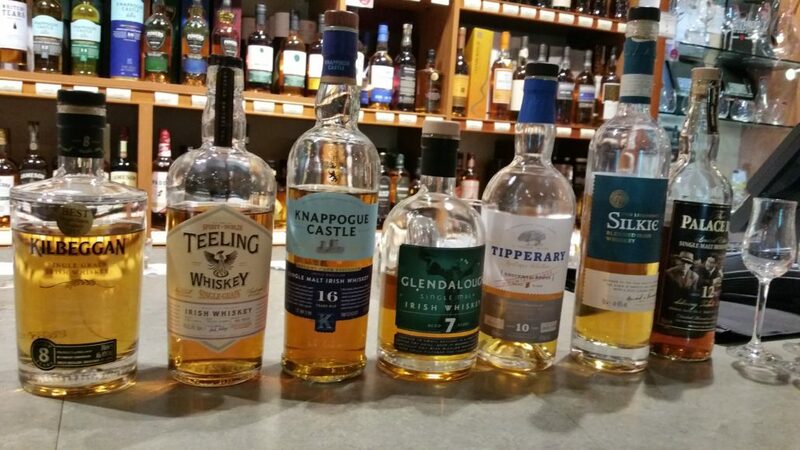 I got involved in a few Irish Whiskey Societies because I realised I have an expensive hobby. Shots in a pub can be very expensive too, more so buying bottles. In the beginning I didn’t like Pot Stills at all because there was too much going on in my palate. Now I love a good pot still. Another question always strikes me: “What is your favourite Whiskey?” I honestly can’t tell because there’s a few I really like. It depends on my mood, the occasion and the company. 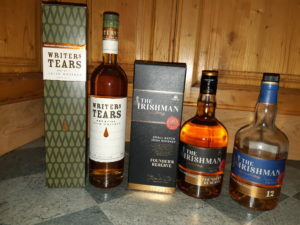 Well, I’m a bit biased as my first bottle I started my collection off with was a bottle of Writers Tears. In trying different types of Whiskey, I discovered at the time, blends are not too bad after all. I also discovered grain whiskey and after a few months I had a second go at Pot Still. What an experience. Now I got it: the different spices, the creaminess, the entire complexity of the different whiskeys. Also if you add a couple of drops of water, it can change the nose and the taste completely. At this stage I love my pot still but I’m open to everything. I like Rum cask finish, Marsala Cask, in short, I have a sweet tooth. I don’t like peated Whiskey for example and in my opinion, if you don’t like Whiskey, you just haven’t found the right one for you yet. 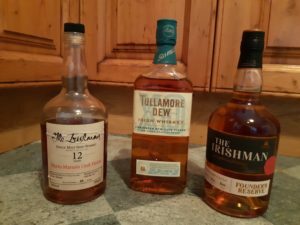 How to get into Irish Whiskey? 2. Join a Society. 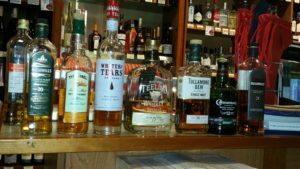 They usually meet once a month, have different whiskeys at one go and you don’t have to buy the stuff. That way you get to experience different whiskeys, can ask the experts and don’t have to buy a full bottle. The first society I joined was the Celtic Whiskey Club. You don’t have to get out of the house, the samples are delivered to your house and you can try them in your own time or enjoy the tweet tasting where you can compare tasting notes with other Whiskey enthusiasts. 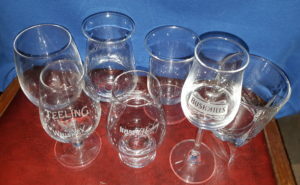 The second Society I joined was the Kilkenny Whiskey Guild. That was an eye-opener in itself. All of a sudden you meet like minded people. Real whiskey enthusiasts and occasional drinkers alike. Not only are you enjoying a few samples, you have a good bit of fun too. The Aviators Whiskey Society is a great bunch of people. They are easy going, very informal and they do a lot of distillery trips. 3. How to drink: get a “nose” first. That’s your first impression of a whiskey. Get a good sniff and think of what you can smell: fruity, floral, spicey, something different? Get a small drop into your mouth, “chew” it, let it roll around before you swallow it. Then decide if you want to add s few drops of water. Think about what you can taste: sweet? Dry? Remind you of something? What about the finish. Does it feel warm, does the taste linger? Aftertaste? 5. Keep trying different Whiskeys and keep asking questions. Even if you don’t like Whiskey neat, why not try a cocktail. There are great mixologists about. One of the best ones I know is Chris Hennessy from Biddy Early and Dylans Whisky Bar. 7. Want to know more? There’ a magazine dedicated to Irish Whiskey. You get all the back ground information about the distilleries, the ambassadors, history, tasting notes and much more: Irish Whiskey Magazine. Join facebook groups – great knowledge but also great banter there. I made friendships in real life due to contacts on facebook or twitter. I love my social media, and it’s great to meet the people in real life. Where are you based Peter? You always can join the Celtic Whiskey Club. Very cool! Best of luck with it and see you in Kilkenny or Carlow at some stage.